That was the dessert part of the dinner when my friend came over. Originally I wanted to make the traditional tarte aux fraises, strawberry tart with vanilla custard (crème patissière). Then I had those beautiful yellow peaches, and it had been such a long time, I did not make a peach tart. So peach tart it was going to be. Eventhough I prefer to make savory dishes than bake, fruit desserts are one of my favorites. Soon, peach season will be over, and we’ll start to find those mushy, frozen peaches with an insipid flavor and with a brownish color, don’t you hate it? It’s beautiful from the outside, and when you bite in it, you just want to spit it out. I still haven’t figured out how to detect from the outside that a peach will be mushy when you open it up. It’s a very almond tart, the crust has almond meal and the crème patissière is flavored with almond, so if you like almond flavor, you’ll love this tart. So far, in San Francisco, I haven’t see the color of summer, so hopefully fall will be my summer, and more tarts are coming this way…I don’t think there is a season for tarts, they’re perfect to consume all year round. I don’t know if this is available in the US, but I brought from France some vanilla bean powder. It’s basically vanilla bean ground, so instead of opening and scraping a regular vanilla bean, this is already ground, and ready to use. If this is not available in the US, you can just open and scrape a regular vanilla bean. If you don’t have individual tart molds, you can just use a regular mold. In a mixing container, add flour and almond meal, mix well, add sugar. Cut butter in small cubes and add to the flour, add water. Knead with the tip of your fingers to obtain an grainy dough but do not over knead it. If you knead it too long you won’t be able to roll it later and it will break apart. That’s the process to make a pate brisée (brisee = broken). Roll in a plastic wrap and place in the refrigerator for about 30 min. Mix eggs, sugar, flour in a mixing container, beat well to obtain a smooth consistency. Heat milk in a pan with vanilla bean powder, and when it’s hot (do not boil) add the egg/sugar/flour mixture. Continue to stir until the cream has thickened, it should take about 7-8 minutes. This cream can boil, since it has flour in it. Remove from heat and add almond extract. Let it cool down. To prevent the cream from forming a crust, sprinkle with granulated sugar and let it cool. Cut peaches in 4 quarters, peel them. cut them in slices about 5 mm thick. Heat a grill pan or regular grill, and grill the peaches slices on both sides. They grill very quickly so don’t over cook them or they will be mushy. Place peaches in a container and coat them with honey and sprinkle with vanilla bean powder. Roll the dough in about a 4 mm thickness. Place in your non stick molds. Place some wax paper on top of your crust, and cook in a pre-heated oven at 375F for about 10 minutes, then remove the wax paper and cook for another 10 minutes. You will have to check the crust occasionally since every oven is different and it might cook too fast and eventually the crust might burn from the outside. When cooked remove form the oven and let it cool. 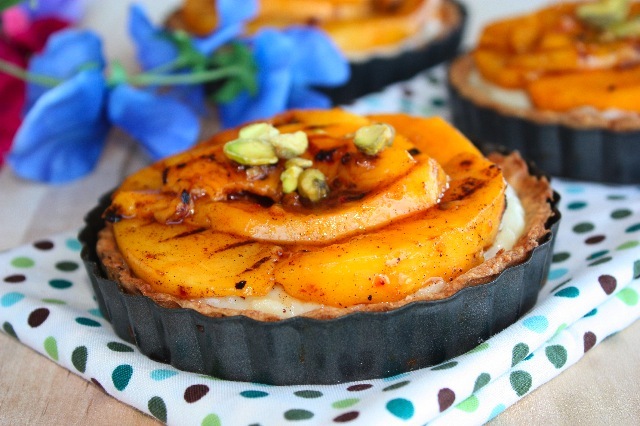 Fill the crusts with almond custard cream, then place grilled peaches on top and sprinkle with chopped pistachios. You can serve it at room temperature, these tarts don’t need to be placed in the refrigerator. This entry was posted by silvia on September 6, 2009 at 9:34 pm, and is filed under Desserts. Follow any responses to this post through RSS 2.0.You can leave a response or trackback from your own site. Oh, this is so beautiful and looks so juicy and smooth and creamy and delicious. I can taste the sweet peaches already. This is a lovely dessert! Another of your recipes that I must try! I love an almond crust! These tartlets are absolutely beautiful! I guess we both had peaches on the brain this weekend Congrats on the #1 spot on Foodbuzz today!! Beautiful! I came way of Foodbuzz’s Photo’s Of The Day and I’m glad I did. Was just looking for an almond cream custard recipe.. this looks fabulous and your photo’s are beautiful!! Ciao! These are so perfect!! I love the entire flavour combination. Your photos are gorgeous! I just bought some pretty peaches at my local green market. I bit into one today and yes, it is mushy. I tried to eat it as the flavor is not so bad but I cannot get past the mush. I guess the only way to tell if it is mushy is to realize that late Sept in NY is too late for a decent peach (sigh). Peaches are my favorite. Almonds and pistachio’s? I am intrigued. Yummy looking recipe. I shall have to ask my friend, who is living in Nice, France for the past year, to send me some ground vanilla beans. I have a couple of vanilla beans in the cupboard; the are so darn expensive. What a lovely creation! I would buy your tartlets.. I had a dream to begin my commerce, but I did not have got enough amount of money to do this. Thank heaven my fellow said to take the loan. Thus I took the sba loan and realized my desire. That can require very long time to improve the writing skills. But under some circumstances, some students are pressured for time. If you really want to save time and money and get the premium quality term paper writing, you should opt for the reliable term paper writing service and order essay there. Then, your university success is guaranteed. Oh my gosh, yum! What a wonderful recipe. 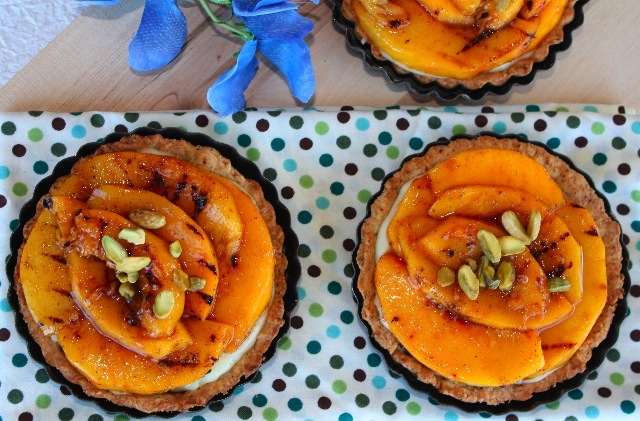 I’m totally salivating over these lovely tarts. Fresh peach season is probably two months away over here. I’m counting down the days…. I am so sad that peach season is almost over…I haven’t seen 1 good peach yet. I love all the almond in here too, combined with the peaches ‘sigh.’ So good. Definitely one of the most beautiful tart presentations I’ve ever seen! Love it!